BrightSign solid-state digital signage controllers are being used to power special video effects at the Oregon School for the Deaf's new haunted house shown October 31st on ABC's Extreme Makeover Home Edition. Pale Night Productions, an innovator in haunted house technology, designed, developed and installed the BrightSign-driven high-definition effects. A BrightSign HD410 interactive player is used to deliver its chilling "Wall Crawl" video effect built into a hallway ceiling triggered with a motion sensor, and a BrightSign HD110 dynamic looping player for its startling "Spectra-Scope" video effect. Project: BrightSign players power special video effects at the Oregon School for the Deaf’s new fundraising haunted house shown October 31st on ABC's Extreme Makeover: Home Edition. Oregon School for the Deaf's annual haunted house event is the school's single largest fundraiser, but a renovation of its 12,000-square-foot haunted house was badly needed. During the Emmy award-winning reality TV program, Extreme Makeover Home Edition, viewers watch a complete renovation of the school's 23 year old Nightmare Factory. A BrightSign HD410 interactive player is used to deliver its chilling "Wall Crawl" video effect triggered with a motion sensor.The Wall Crawl plays on a 46" LCD TV screen mounted in the ceiling of the hallway leading into the haunted house. The effect is triggered by a mat switch spliced into a cord that connects to the BrightSign HD410 controller’s GPIO port. When visitors step on the floor-mounted mat switch, the video begins with a view up into the turret of an old mansion. As lightning flashes through the windows, a ghoul is seen plastered to the ceiling. She then begins climbing down the walls in contorted poses before lunging down for a shocking end. A BrightSign HD110 dynamic looping player for its startling "Spectra-Scope" video effect. 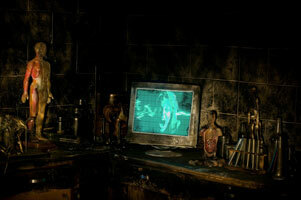 Installed in the Biology Lab scene within the haunt, the Spectra-Scope uses an HD110 to play on an old CRT computer monitor. The HD looping video simulates a haunted version of an oscilloscope. The trace on the screen flickers and jumps all around and occasionally shows a ghoulish face appearing in the screen.